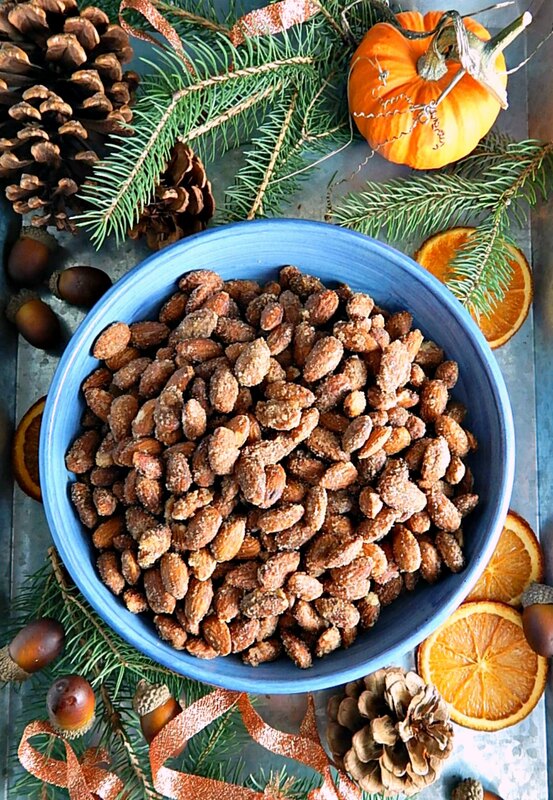 One thing I do love around the holidays is these salty, sweet nuts with just a bit of a kick to them. They’re a little sugary, a little salty, slightly spicy, crunchy and just divine. And Sweet Spicy Slow Cooker Nuts are pretty much addictive. Sweet Spicy Slow Cooker Nuts are great to have on hand to put out if guests drop by or to include in a cheeseboard or party tray. And a package of them in a pretty bag or jar makes a great little gift or hostess gift. Making the Sweet Spicy Slow Cooker Nuts is going to make your whole house smell of the holidays. The flavors just scream “Holiday.” There’s Ginger, Cinnamon, Clove and then just to keep them from being kind of a one-note sweet, there’s a touch of cayenne. And while I wouldn’t call them necessarily “hot” but that little hint of spice does come through. The beauty of making a recipe like Sweet Spicy Slow Cooker Nuts is that you can vary it in so many ways. As long as you keep the proportion of egg white, nuts, sugar, and butter the same, you can vary the kinds of nuts, the type of sugar and especially, the kinds of spices you want to use in this recipe. The sky’s the limit as far as flavors. Maybe you have a recipe of your own you’d like to try with this method or maybe you’ll be inspired by some product you’ve seen in a shop or online. What the slow cooker does for you is pretty much eliminates any risk of burning (you do have to be on hand to stir every twenty minutes and do watch and stir more often at the end) and it heats the nuts slowly, gently bringing up their natural oils. And of course, the slow cooker frees up your oven for other items just in case you might be doing some holiday baking. The recipe I’ve used in the past has been this one from Midwest Living but while I loved the flavors, I was never really completely satisfied with the nuts when they were done. Sometimes they were a bit soft and then I had to finish them off in the oven. Then recently I came across a method on How To Make the Best Slow Cooker Nuts from The Kitchn that I wanted to try. So I adapted and combined the two recipes together. My nuts came out perfectly crunchy and were absolute perfection. Make sure to really spray your slow cooker well, much higher than the level of the nuts so when you stir the nuts, the sugary residue won’t stick to the slow cooker. The residue on my slow cooker where it was sprayed cleaned up easily with hot water and soap but up higher, where I hadn’t sprayed I had to soak for hours and scrub. I also found this particular recipe won’t work well with fewer nuts, and it’s hard to scale with the egg whites, so just in case you were thinking you’d like to make only 4 cups of nuts, for instance, don’t do it! You definitely need the right proportion of the syrup and nuts for it to cook right. And while the Kitchn says the nuts keep for a week mine were fine after several weeks. If you do keep them longer and they lose some of that crispness, they can be placed into the oven at 400 degrees F. on a sheet tray and heated for about 10 to 15 minutes, stirring once or twice and recrisped. The larger oval-shaped slow cookers work better for the recipe (more surface area) and do make sure to stir more often at the very end – I used a spatula to scrape them off the bottom and do make sure to cook until all the nuts are dry. If they’re shiny and wet, they’ll stick to your sheet tray and not be perfectly crisp. If that happens, you can pop them in the oven for a few minutes to dry and crisp up. The Kitchn uses a double layer of paper towels over the top of the slow cooker to absorb moisture. I just used a kitchen towel since I rarely have/use paper towels. This recipe for Sweet Spicy Slow Cooker Nuts works with just about any nuts you’d like to use. The original Midwestern Living recipe suggests cashews, almonds, hazelnuts & pecans. I was so shocked at the price of pecans last time I went to the store I just stuck with almonds which I usually get at Costco or Aldi. Nuts can be expensive, so check the bulk bin or buying clubs for the best prices, and the Aldi price was just as good as the Costco price. Fall is the time of year to clean out your stash of nuts from the previous year and put them to use before restocking. You’ll find nuts at their low in the fall after harvest and up through the Thanksgiving, Christmas and New Year’s sales. The fridge is okay for storage, but for maximum shelf life, toss nuts in your freezer and preferably your deep freeze where they’ll stay fresh a lot longer. While this PDF is geared towards growers it does have some good information and charts about how long your nuts will stay fresh. Lightly coat a 6-quart slow cooker with cooking spray. Add egg whites to slow cooker and whisk the egg whites until foamy. Add the sugar, butter, and spices and stir until a thick syrup forms. Add nuts and stir to coat the nuts in the syrup. Cover the top of the slow cooker with a clean dishcloth or two layers of paper towels. Place lid on top, then cook on low for 3 to 3 1/2 hours or on high for 1 1/2 to 2 hours, stirring every 20 minutes and every few minutes at the end, until nuts are fragrant, lightly browned, and the coating appears dull and not shiny. Remove nuts from slow cooker (there will be excess sugar coating left behind.) Spread nuts into an even layer onto 2 parchment-lined baking sheets, spreading them out and separating as much as possible. Cool completely, stirring once or twice so the nuts won’t stick. Once cool, break apart any nuts that have stubbornly stuck together and transfer to a serving dish, jar for gifting, or airtight container for storage. Store in an airtight container at room temperature for several weeks. If nuts soften with storage, crisp them by placing in a 400 degree F. oven for 10 to 15 minutes, stirring often. I’ll be sharing Sweet Spicy Slow Cooker Nuts at Fiesta Friday #251 where this week I’m one of the co-hosts along with Monika @ Everyday Healthy Recipes. This entry was posted in Click here for Fabulous Food Posts and tagged Appetizer, Candy, kitchn, Midwest Living, nuts, Slow Cooker. Bookmark the permalink. Bernice, i ate so many I don’t want them for awhile, lol! But they were so good and pretty much addictive! I am definitely going to try these tomorrow! I just burned 4 cups of pecans in the oven, trying another recipe, and was so upset to waste those. Your method sounds like there is much more margin – especially in the first couple of hours. I am more of a lurker than a commenter, but I really enjoy your blog, have read it for years, and just had to tell you how much I enjoy your recipes and writing. Thank you! Hi Diane, I did the same thing, more than once, with the burning! You still have to watch it at the end but you are exactly right – there is so much more margin of error! And thanks for lurking and the nice compliment. 🙂 I remember a few comments you’ve left here and there. 🙂 Unless there’s another Diane. My best friend in grade school was Diane, btw! They were great! I did a mixture of almonds and pecans. I think I will do one or the other next time, as the pecans seemed done before the almonds. I ended up picking the almonds out and cooking them a little more on their own. Thank you for such a delicious recipe! Hi Diane, thanks for checking back. I think you are right, pecans (and walnuts) seem softer than almonds. I’m going to mention that in the recipe…Merry Christmas if I dont’ “see” you before! Do you use raw nuts or roasted nuts? LeeAnn, hi I’ve been buying the big bags of nuts at Costco and they are toasted. I think this recipe would be fine either way because the nuts would toast in the slow cooker but have not tried it with raw nuts. That’s a great question. I can’t do eggs, what would you suggest as a substitute? Paul, the eggs keep the sugar from getting hard like a caramel which is basically melted sugar. I wonder if you added about 1/2 teaspoon of baking soda to it if that would work. I just mention it because when I make caramel corn, there’s a touch of baking soda in it to keep the caramel softer, not like a hard shell. I also wonder if you could use Aquafaba. See this article https://www.healthline.com/nutrition/egg-substitutes I guess I’m assuming that finding a commercial egg white substitute would be hard to do for most people unless you order it online but the aquafaba can be spooned out of a can of chickpeas. A lot of “cheffy” types have been using aquafaba recently. Hope that helps! thanks, I’ll give those a try and let you know how they work. I am going to try these. This and a steaming pot of Gluehwein, and I will be transported to my favoriteGerman Weihnachtsmarkt! Vielen Dank! Nutty about Nuts – great recipe. Thanks so much! They’re fun! I can just imagine how more-ish they are Mollie! Thanks Laura! They are divine! Hey Mollie–You’ve got my attention on this one– love anything nutty, sweet, salty!! And I never would have thought to use a slow cooker!! And– your photos are especially beautiful– love the colors around the nuts. Pretty. Hope you’re doing well. Waiting to see what else you are cooking up for Christmas! hugs friend! Would you believe I fell down and hurt my shoulder…and it keeps getting worse. I sometimes have to pick up my arm with my other hand. I was hoping it would just heal up on it’s own, but now I have to go to the doc…the joys of getting old…But yes the nuts were so good. I am trying to save some for my cheese tray but I keep snitching them! This is one nutty recipe Mollie. They sound wonderful. I’ve tasted some similar, but the were baked, The slow cooker methods sound like a better way to go. Best wishes for your Thanksgiving holiday weekend and I hope your team wins. Hi Ron, thanks, and Happy Thanksgiving to you! I find I don’t burn them in the slow cooker. Well I had no idea these could be made in a slow cooker! Probably much easier. Thanks so much, and have a wonderful Thanksgiving! Thanks Mimi! Hope you’re having a wonderful feast! Well, I can’t wait to try these!! This could make great holiday gifts!